When de new govt tek office Soulja Bai tell Moses that he must be responsible fuh constitution reform. Yesterday Moses give dem boys de biggest laugh. De constitution seh all it want is a majority of people in de parliament to dash out a govt. Moses now seh that de constitution should not mek it suh easy fuh anybody to dash out a govt. That sound like a Nancy story. Dem boys seh he had three years fuh mek all de changes and recommendations. But he sit down; fold he foot till he get de kick in he behind. Now ee eye open and he see de constitution want changing. Everybody remember is de same Moses who was using de same constitution fuh dash out Donald. It was good then fuh he and he party but now it suddenly tun bad. 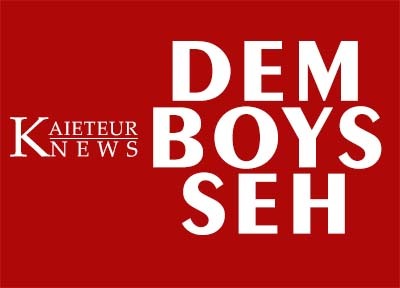 Dem boys seh is a new trend wheh people shutting down Govt and is Donald who start it, not Donald Dumb. Is Donald trump set de trend. Now everybody following. De constitution is de law of de land. Things that wukking good, Moses now want to change. Dem boys wouldn’t be surprised if he wake up tomorrow and seh de Man above shouldn’t mek it so easy fuh people dead. Dem boys seh wha he should focus on in de constitution is how to mek it harder fuh government people to thief and walk free. Today, he got Jagdeo, that scamp, who did de gods, when he was in office, challenging de president fuh expose all de corruption he and he govt do. And he telling dem to expose it before dem lef office. This is like a man who thief, got de loot in ee pocket, and go in front de police station and challenge dem to lock him up and charge him. When a man like Jagdeo can do that and nutten happen, it means de people who got to tek de action is doing de same or worse. Or it could be Jagdeo got secret fuh dem. Talk half and see if dem gun tek up Jagdeo challenge.